Inside: DIY Toy Storage Bags – A fabric peek-a-boo bag is an easy and clever solution for small toy storage. It is official! My. kids. have. toys. And as my daughter gets older her toys seem to be made up of lots of little things. And I thought big bulky primary colored stuff was bad! Ha! I had to come up with a way to keep all those pieces together that she could get out and put away by herself, and have it jazz up our play space with fun fabrics! Just look at my little lady! She is a very organized three year old so these put a giant smile on her face. (I have no idea where she gets the “everything in it’s place” thing…who ME?) Anyway, she is already in love with getting these bags out, playing, and then putting them back! four 2 1/2 inch pieces of bias tape. Step 2: Fold the bottom edge of the front top piece under 1/2 an inch and iron to keep flat. Do the same to the top edge of the front bottom piece. Step 3: Fold the top edge of the back piece under 1 inch and iron to keep flat. Do the same 1 inch fold to the top edge of the front top piece of fabric. Step 4: Line up the vinyl with the folded back edge of both the top front and bottom front pieces of fabric and sew into place. 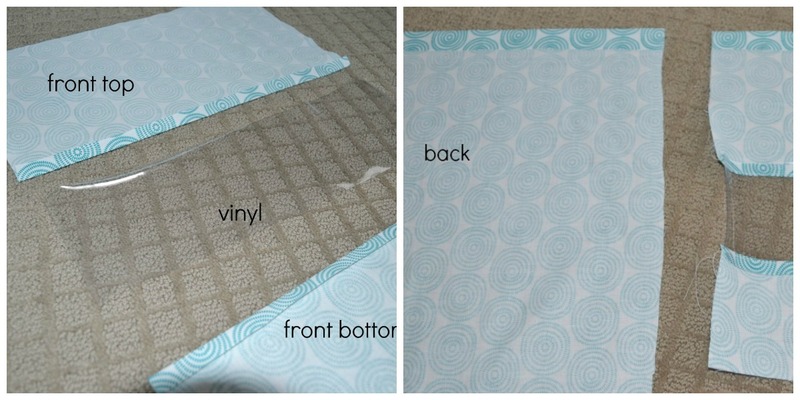 **Sewing vinyl can be tricky because the foot on your sewing machine sticks to the vinyl. To make it easier put a small piece of painters tape on the foot and it will slide through. Step 5: On both the back and front top pieces (that you folded down 1 inch) find the exact middle and mark it. Step 6: Measure 1 1/4 inches from that mark in each direction so that you have a 2 1/2 inch line along the ironed edge. 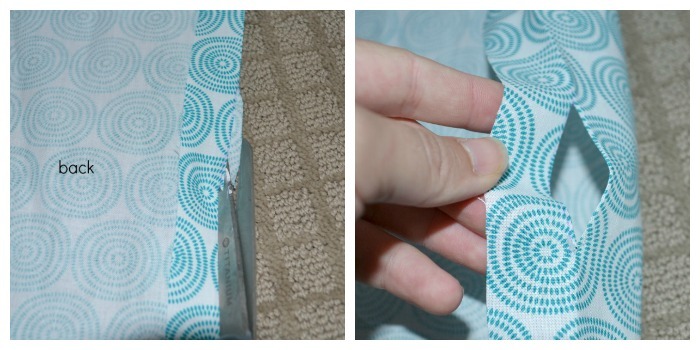 Step 8: Fold a piece of bias tape over each edge of your slit and sew into place. 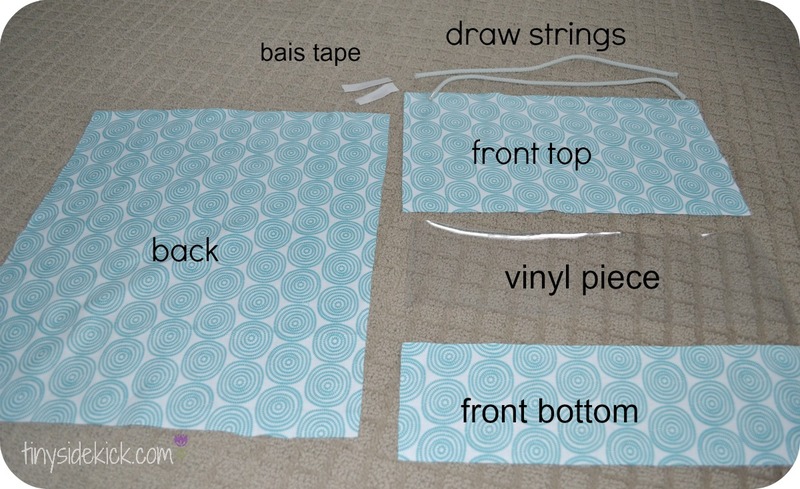 Do this for both the back piece and the top front piece of fabric. Step 9: Place a piece of draw string on the ironed line and fold the fabric over. 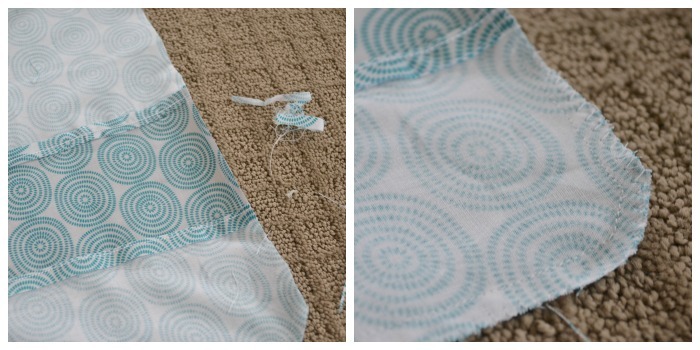 Sew the flap down, but do not sew the draw string to your fabric. It will be in the tube loosely. Step 10: Now place your finished front piece and the back piece together print side in and pin in place. The most important part that you need to line up is the top edges where your draw strings are. 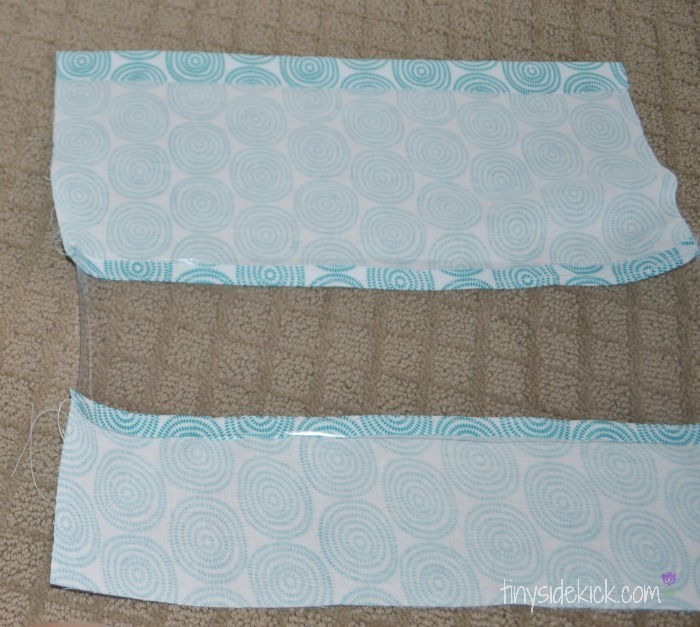 (If you are new to sewing you are bound to have some edges not lining up correctly. That’s ok. Just trim them so that everything is even before you start sewing. Ha! Don’t tell the experts I told you to do this. Step 11: Sew around the 3 edges (NOT THE TOP EDGE) using a 1/2 inch seam. It is really important that you catch the draw string in the seam here. Go slowly cause it’s thick. 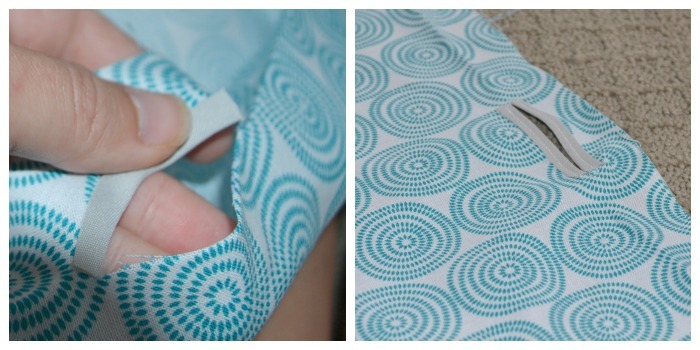 Trim any uneven spots after you sew your first seam and then serge the edges. 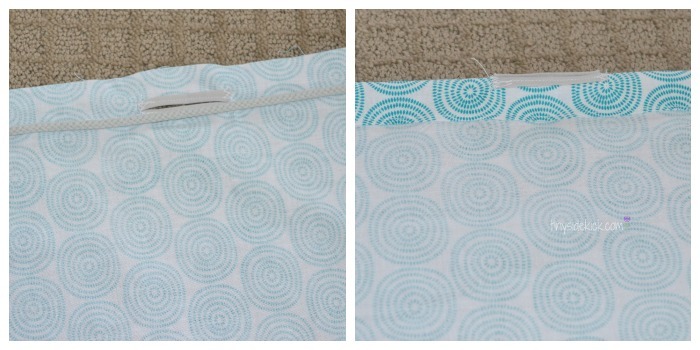 If you don’t have a serger (like me) just sew along the edge with your zig-zag stitch. Now turn your bag right side out and fill it with some junk…uh..I mean, TOYS! What do you think? Do you make an effort to make the toys in your house organized? I’ve been working on getting our play space (our loft) a fun place to be. So far I’ve created a completely kid friendly ottoman, a reading nook , and a fun place to display the kids’ art! The materials list indicates 1/2 yard of drawstring. Instructions say to cut two 15 inch lengths. Recommend that you modify the materials list. Sherry, thanks for catching that. Fixed! Glad you love the bag! love this for the grandchildren’s toys BUT I am also going to use it for my sewing projects, (I usually have several in the go at the same time!!!! ), as well as great presents for my sewing friends. Thank you for your generosity! You’re very welcome, Suzanne. Great idea! Who says these are just for kids?!! I’m making some for myself! It’s difficult for me to get things out of my bottom kitchen cabinets so I keep some things on a shelf in our basement. But then I have to wash them before using because they’ve collected dust down there. Now I can put them in bags like this and see what’s in there but also keep them clean! Wonderful! THANK YOU!!! What an awesome use for the bags, Mary! Thanks for sharing. Your tutorial is the only one I’ve seen that reinforces the drawstring opening. I’ve been so confused by other draw string bags that just leave a raw edge! This is a really simple but clever solution. Thanks! You’re so welcome! Happy to hear you found something that works well for you, Emily! I made one of these today to contain a foam puzzle my kids got for Christmas. It’s so cute and I’m already planning more for Little People, Hot Wheels, and ponies! Glad you found it helpful, Dominique! It’s such a fun and practical solution! I just love this idea. I think my daughter (she is 5) would love to wheel this around, and hopefully love to pick up after herself! What kind of needle would you use to sew vinyl? I have wanted to try for a while but not sure on thread and needle?! I used regular thread and a slightly thick needle. The same needle I would use to sew thicker home decor fabric. Good luck on your project, Kaela! This is so much nicer than a plastic tote if you are traveling. Those bags are awesome! It’s a perfect solution for storing my daughter’s toys. Thanks a lot for sharing!! You’re welcome Gladys. I was just sorting the kid’s toys this morning and now instead of blocks, they have bigger kid toys like Legos. I love that the kids can get out what they want and then easily put it away. These are adorable..I plan on making some for my little guy..I showed this to my teenage daughter and she wants me to make mini ones for her make up and hair accessories …gulp!…wish me luck!!! That is such a great idea Jamie! Let me know how they come out and send me some pics! My adult daughter crochets and uses drawstring bags to store her unfinished projects — she likes to go from one to another, working on several at a time. A window will allow her to instantly see which project she wants to work on without trying to remember which fabric each project is stored in. I’m going to surprise her with a few of these bags! Perfect solution, Lin! I’m thrilled that readers are coming up with creative uses for these bags! Corey, these are cute as are the other items in your post but I hope you realize that easy is in the hands of the crafter? In this case, crafter could be seamstress. I love the ideas but cannot sew to save anyone’s life. Back in the day of Home Ec classes, my mother actually sewed my home project, her sewing machine was a contankerous old thing and would break down if anyone else sat at it except mom. I did all the hand work, cut the pattern out & marked it, but she did the sewing – something she’d never done before or since. These are so cute and very handy to have! I’d love for you to stop by and share them at our craft party! Um, these are AWESOME! And I love the fabric you chose too! Now I just need to learn how to sew… 😉 Pinning! GREAT IDEA!! These look really easy to make and turned out so cute. We have those same plastic balls and they are all over the place. I need to make these bags for sure. What a cute idea Corey! Thanks so much for sharing the tutorial! Look at you, smarty pants! Love this idea. I wish my kids had a bit more of the “everything in its place” gene. LOVE this idea! So doing this! These are so terrific and perfect to store all those little things that kids have! Great idea and appreciate you sharing it with us. So, CELEBRATE! ♥ YOU’VE BEEN FEATURED! on the BeBetsy BRAG ABOUT IT No. 18. http://bebetsy.com. Great idea! Definitely need to make some of these for my sons cars and toys! I would LOVE to have you share these at my link party! Following you via facebook! Excited to see more! What an awesome idea! I seriously wish there had been blogs back when my kids were small. It would have made my life so much easier, and organized 🙂 Thank you so much for joining us and sharing at Best of the Weekend! Pinning to our party board. Enjoy a wonderful week and please join us next Friday. Very Cute! what a great project. That would even be a great bag to take for play dates! Thanks for linking up to the frugal, crafty, home blog hop! We appreciate your participation! These look fairly simple and yet are very cute! I don’t have kids, but I could see these being very handy for other storage… like food, clothing, etc. Thanks for sharing! These are fantastic! You could sell them. I’ll be your first customer. I love this idea!!! And keeping them on the wall means more space in the room to play!